This is a project that has been a long time coming. 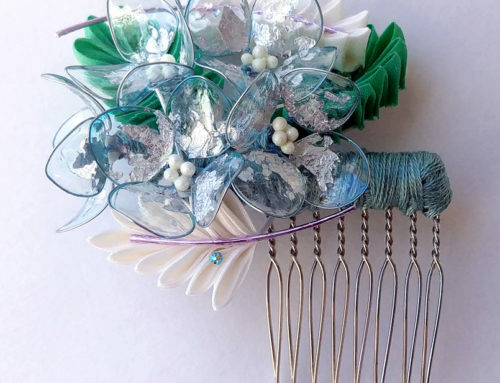 Making a kushi (comb) has been one of my dream projects, which I was nervous about starting on because I wasn’t sure how well it would turn out. So, I’ve had a set of wooden combs sitting in my supply box for almost two years. Since I’ve gotten a few canvases and larger pieces under my belt, I thought it was time to break out the wooden combs and have a go at it. 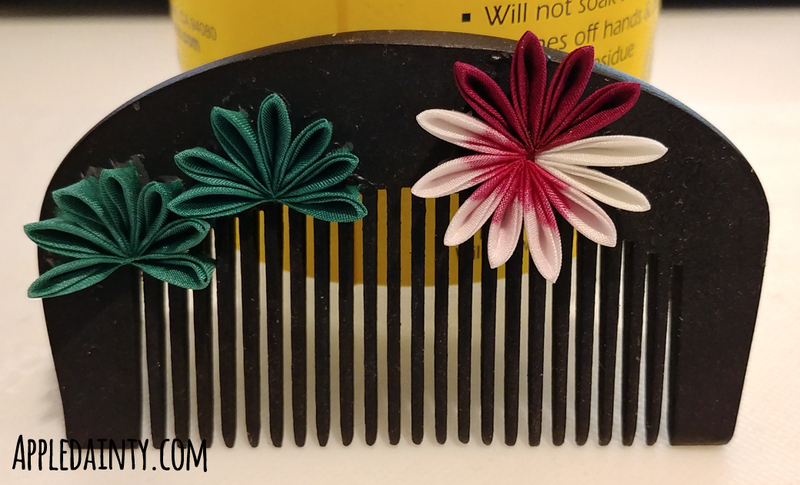 I started by painting the comb a nice flat black, using plain acryllic paint. 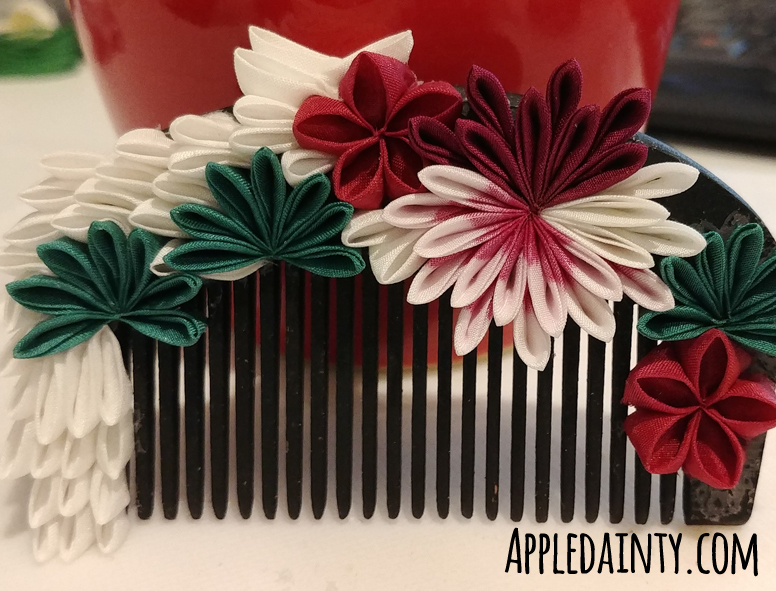 The combs came in a natural wood color, but I wanted a starker contrast with the white and red petals, which I thought black would provide. Once the paint was dry, I started applying the petals. I did the pine foliage and chrysanthemum first, followed by plum blossoms, and then the white filler petals. 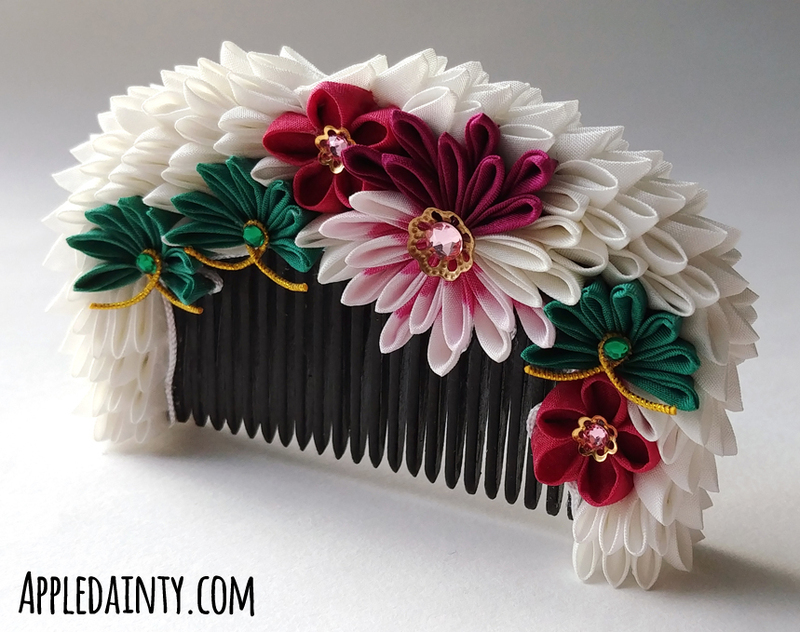 Once all the petals were filled in, I applied a varnish to the comb’s teeth. I thought about doing the varnish first before applying petals, but decided that the glue would have an easier time adhering to the matte paint than the varnished surface. Once the varnish was dry, I proceeded to glue a nylon cord ‘liner’ around the edges of the design. 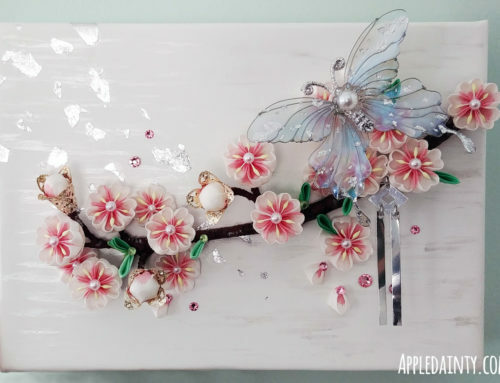 Once I finished shaping the round plum blossom petals with a bit of spray starch, the last thing I did was add the little details – mizuhiki, bead caps, and rhinestones. 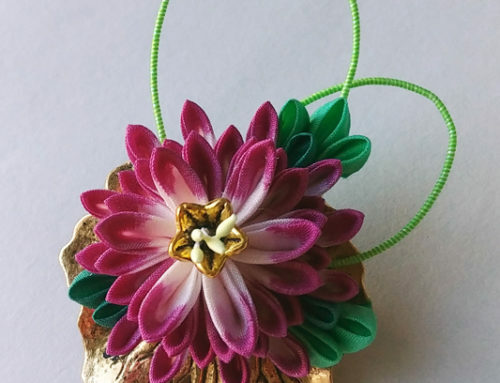 I’m really pleased with how this kushi came out and now that I’ve gotten past my apprehension about making pieces like this I’ll be able to stretch myself a bit and do some more exciting designs. 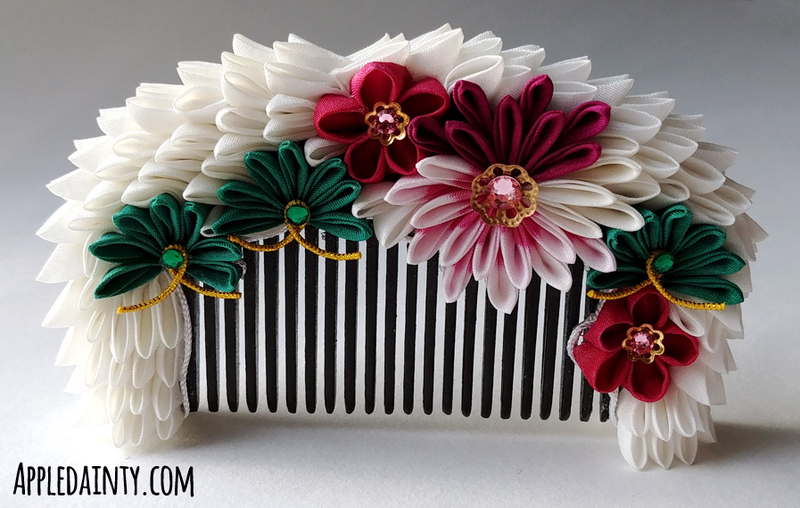 I have some ideas about maybe sculpting a bit onto the comb with paper clay or using chipboard to modify the shape of the comb; I’ve read some interesting tutorials and seen some fascinating historical kushi designs that I am hoping to draw inspiration from. This piece will be available at Anime North’s Gallery Momiji in May, along with my pieces from The Pathos of Things. I’m super excited about this show, and hopefully I’ll have confirmation on panels and workshops to share with y’all soon. 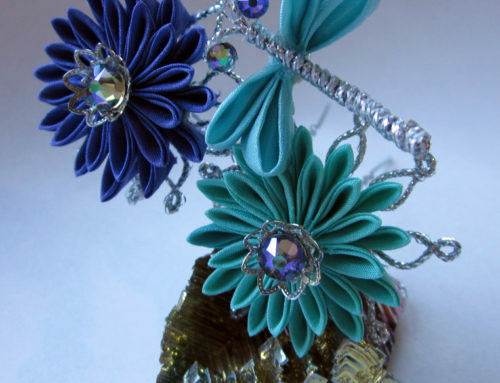 Follow @jfashionnorth on Instagram for fashion – and kanzashi – related announcements! Anyhoo, if you like this blog and want to help support it, consider buying me a coffee. Your support is greatly appreciated, and I hope that you check back again soon for more art, crafts, and creativity! Like my blog? Consider supporting the blog by buying me a Ko-Fi!